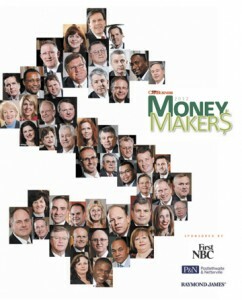 City Business recently announced its 2012 Money Makers honorees revealing many Jefferson Chamber members on the list. According to City Business, the list recognizes financial professionals, “whose fiscal work, accomplishments and achievements have not only set the pace for their company but the regions as a whole.” Jefferson Chamber members filled 16 of the 50 positions honored. “I believe this a very positive thing for the Jefferson Chamber. To have so many of our members recognized reflects well upon us. Building business is one of our main objectives and these individuals are carrying that out in both their workplaces and in our organization,” Todd Murphy, Jefferson Chamber President said.